Like a great acting performance, making a really good game is all about choices. While creating or playing a game, those involved have to constantly make small choices that will affect the outcome, either positively or negatively. And the only thing worse than choosing wrongly is not choosing at all. Too many games, especially today, stick to what they're supposed to do from the get-go and avoid making difficult, small, meaningful choices to differentiate themselves and make their performance special. Both of the games below never shied away from making choices. Thanks to all of the little odd decisions throughout, these are something more than the fairly typical genre games, for better or worse. The Summer of Arcade has finally come to a close now that Diabloesque dungeon crawler Crimson Alliance (by FPS map-pack mavens Certain Affinity) has arrived. If you've purchased all five of the previous Summer of Arcade games, Crimson Alliance is 100 percent free! But for the rest of us, the pricing structure is a little unorthodox. The game is listed as free on XBLA, but download it and you'll discover that you've actually just downloaded the trial version! You can play a small part of the game for free with any of the three characters, but an in-game menu will prompt you to pay either 800 Microsoft Points for a single character pack, or 1200 for all three. Even more interesting, players can use up 80 points in-game for 40,000 gold coins, allowing you to instantly buff out your character with the best weapons. Many free-to-play MMOs subsist entirely on this model, but this is the first time I've seen it in a console game. I'm not sure who exactly the $10 version is marketed towards, since it's not that much less than the $15 one and doesn't include the full version characters for your friends to play with. And if you're going to play this game, playing with friends is the way to go. 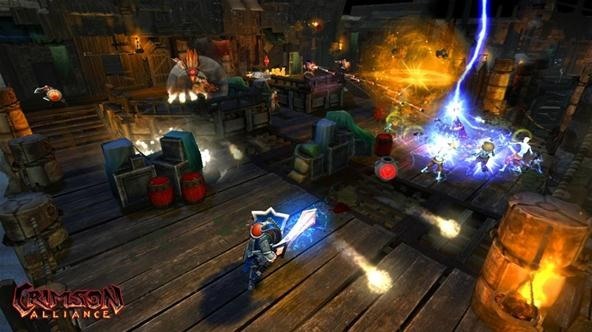 Torchlight, the last best Diabloesque available on the Xbox 360, didn't have multiplayer, which quickly became everyone's biggest problem with it (although forthcoming and quite fun, Torchlight II corrects this problem). It was what made Diablo II the grandaddy of the genre—an institution. 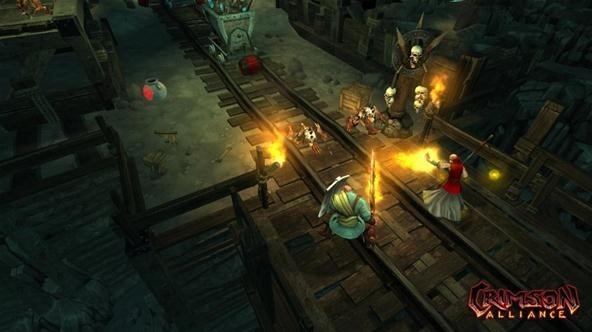 While this game might look like Diablo II and Torchlight on the surface, it makes some bold choices in its performance of the standard dungeon crawling loot-em-up action RPG. The first thing one is likely to notice is the combat system. Rather than having one attack button and learned special abilities mapped to the other buttons like in its competitors, combat in Crimson Alliance has more than a hint of Dynasty Warriors in it. There are three attack buttons and a dash per character, and they do pretty much the same thing for the entire game. Special moves can be used only after killing a lot of bad guys at a stretch. There are no magic points, no experience points, and no skill trees. All character improvement occurs by purchasing items. In short, the game is a streamlined, console-fied take on the genre. All this simplicity turned me off when I was playing alone. But with friends, when taking the time to fuss with distributing skill points is annoying to all those around you who want to keep running and slaying, it keeps the action going and makes the game a great multiplayer experience. It makes Crimson Alliance much more special. Give the "free" version a try with some friends, and you'll probably be hooked, too. It's only natural that Penny Arcade would be involved in making great video games. What's more surprising is that it took me this long to play them! I might never have, but Jerry and Mike had decided to resurrect the previously (and somewhat messily) cancelled third game of the series with a new developer, Zeboyd Games. This news piqued my interest enough to finally download the first two installments of the series. Adventure games and RPGs have a lot in common, but have seldom gotten together. 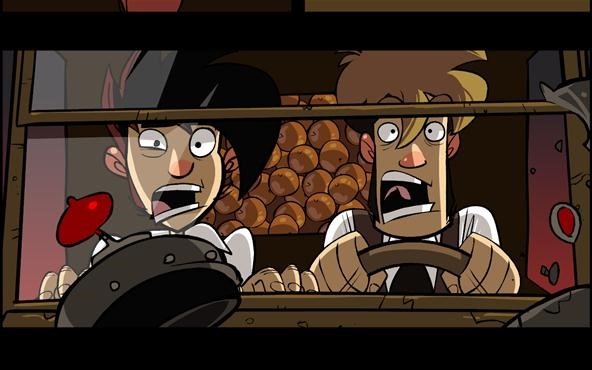 Clearly, the folks at PA love both genres very much, because Penny Arcade Adventures: On the Rain-Slick Precipice of Darkness (PAA:ORSPD) is a love letter to both in their classic forms. The games takes place in Gabe and Tycho's alternate universe in the '20s, with the boys and a generic player character solving outlandish supernatural crimes. 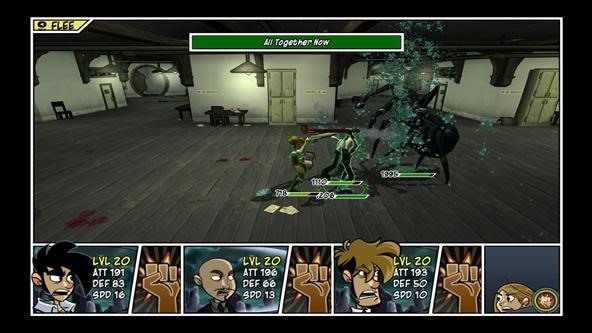 Combat is a hectic but old-school JRPG affair with a tiny dash of D&D thrown in, while it remains traditional, modern, and fun at the same time. Non-combat gameplay is a pretty straightforward point-and-click adventure game. I played it on the Xbox 360 and the adventure gaming segments suffer on the console from poor controls. It's hard to make the characters interact with the objects you'd like, since you have to point them at objects with the analog sticks instead of just clicking on objects like you would on the PC. All of that is great, but the writing and story that go along with these games is some of the best I've ever seen. Penny Arcade is funny, but this game lampoons every genre convention it can find so skillfully it would actually be a good example of any of those genres, if it wasn't so blatantly mocking it. There is more well-written text in these short games than in most any full-length one. For those who read all of the text in their games, these are indispensable. Grab 'em off Steam.